Fungi play a central role in both ecosystems and human societies. This is in part because they have adopted a large diversity of life history traits to conquer a wide variety of ecological niches. Here, I review recent fungal genomics studies that explored the molecular origins and the adaptive significance of this diversity. First, macro-ecological genomics studies revealed that fungal genomes were highly remodelled during their evolution. This remodelling, in terms of genome organization and size, occurred through the proliferation of non-coding elements, gene compaction, gene loss and the expansion of large families of adaptive genes. These features vary greatly among fungal clades, and are correlated with different life history traits such as multicellularity, pathogenicity, symbiosis, and sexual reproduction. Second, micro-ecological genomics studies, based on population genomics, experimental evolution and quantitative trait loci approaches, have allowed a deeper exploration of early evolutionary steps of the above adaptations. Fungi, and especially budding yeasts, were used intensively to characterize early mutations and chromosomal rearrangements that underlie the acquisition of new adaptive traits allowing them to conquer new ecological niches and potentially leading to speciation. 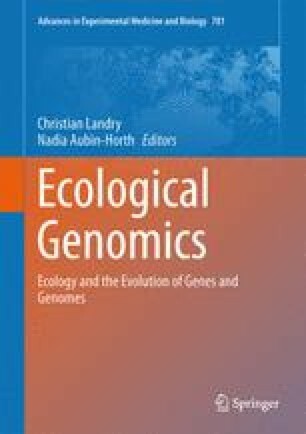 By uncovering the ecological factors and genomic modifications that underline adaptation, these studies showed that Fungi are powerful models for ecological genomics (eco-genomics), and that this approach, so far mainly developed in a few model species, should be expanded to the whole kingdom. I address special thanks to Mary Thaler, Isabelle Gagnon-Arsenault, Guillaume Charron, Emilie Bernatchez, Marie Filteau, Luca Freschi, Philippe Reignault, Sylvain Billiard, Louis Bernier, Christian R. Landry and two anonymous reviewers for helpful comments. This work was supported by a Natural Sciences and Engineering Research Council of Canada (NSERC) grant and a Human Frontier Science Program (HFSP) RGY0073/2010 grant allocated to Christian R. Landry. I was supported by a fellowship from the Fonds de Recherche en Santé du Québec (FRSQ). Organism spending its entire life cycle within a plant. When a cell contains two or more nuclei. When sexual reproduction can only occur between two phenotypically indistinct individuals from the same species, but expressing different sexual idiomorphs (allogamy). Mostly present in algae and Fungi. When sexual reproduction can occur between any individuals from the same species (autogamy), in contrast to heterothallism – Pseudo-homothallism derives from heterothallism but the co-transmission of two sexual idiomorphs during meiosis allows autogamy. Sexual determinants in eukaryotes. Designates compatible sexual partners during reproduction: for instance male and female in plants and animals or MAT-a and MAT-α in yeasts. Symbiosis between a fungus and roots of a vascular plant. Ectomycorrhiza perform the interaction within the host tissues whereas endomycorrhiza perform the symbiosis within the host cells. Portions of the genome physically co-segregating with an inherited trait, and thus physically linked to at least one gene involved in this trait. Fungi able to absorb nutrients from dead or decayed organic matter. In Fungi, a unicellular, resistant reproductive structure formed by meiosis or mitosis, able to produce a new individual after possible dispersal and germination. Ascospores are spores produced by Ascomycota. Close and reciprocally beneficial interaction between two organisms of different species, providing each other with protection, suitable habitat or nutrients.